Heather is a Training Specialist with more than 20 years experience. A former professional beach and indoor volleyball player, she brings a passion for people and a unique team perspective to her work. She has designed and delivered programs covering a wide variety of topics including Behavioral Styles, Conflict Resolution, Emotional Intelligence, Communication, Accountability, Organizational Leadership, Experiential Initiatives and more. She facilitates 360 Degree Feedback and is a certified Executive Coach. Throughout, she has balanced the needs of individual learners with the ability to deliver on-time, content-rich programming. She has delivered courses to thousands of employees from small businesses to Fortune 500 companies. Her knowledge and inclusive approach make her an effective and respected trainer and coach. Heather is passionate about creating philanthropic programs that create a rich team experience for clients and a lasting impact for community partners. Heather holds a B.A. in Journalism with a Minor in Marketing from California State University Northridge where she is a member of the Athletic Hall of Fame. She also holds Associate degrees in Human Services, Social & Behavioral Sciences, Supervision & Management; and Emergency Management/Homeland Security. She is the former VP of Special Interest Groups for the Association for Talent Development (Orange County Chapter), a Community Emergency Response Team (CERT) member and American Red Cross volunteer. When Heather is not supporting people in their professional and personal development, you can find her with family, in the butterfly garden or with her rescue cat and dog. Ron Roberts is the founder of Action Centered Training (www.CorporateTeambuilding.com), ACT Games, LLC, ACT Government Services, and Egolibrium LLC. (The Well-Balanced Leader), of Eagleville Pa. (Near Valley Forge). Professor Ron Roberts is among the top consultants and trainers in United States in the area of accelerated experiential Learning. His workshops are legendary and in high-demand; he frequently serves as the keynote speaker or presenter at national conferences and professional meetings. This is because he is an extraordinary educator, author, keynote speaker, trainer, inventor and consultant. Corporations: ADP, American Express, AT&T, Bank of NY Mellon, Fujitsu, General Electric, Home Depot, IBM, Motorola, Stryker Medical, J&J, Merck, Pfizer, Pillsbury, Prudential, Raytheon, Siemens, Sunoco, Teleflex Medical, at the highest executive levels. Federal customers: Veteran’s Affairs, DOT, FEMA, NIH, FDA, HHS, NSA, and extensively with the US Army, US Navy and Marines, US Air Force, including senior staff in all areas. He teaches at Penn State University, Berks Campus. He also teaches in the Online Gaming and Simulations Program at DeVry University. Ron Roberts previously owned a Counseling Center for 12 years where he specialized in family and couples counseling. 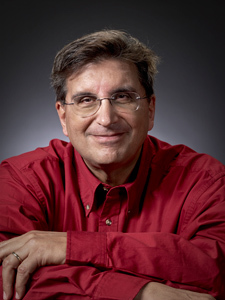 He has authored numerous books and articles, including Learn-o-grams: pictorial puzzles for trainers (Wiley), and Junkyard Games: the outrageously fun innovation simulation (HRDQ). He has created over 70 Accelerated and Experiential Learning games (board and card), tools and digital applications, and holds 6 patents on cutting-edge learning technology. He has been a keynote speaker at ASTD (Training and Development), NASAGA (Games and Assimilations), AAL (Accelerated Learning) conferences, and done many workshops on game design, debriefing games, and innovation. Ron Roberts has done game design for private and government organizations as well as private ventures. Besides appearing in Newsweek, Wall Street Journal and Games Magazines, Ron has appeared on ABC, NBC Today Show Weekend Edition, CNN Live, NPR, and the QVC network. He is also cited in Who’s Who in American Educators. Ron and his wife live near Valley Forge Pa., have 6 grown children and are expecting their 9th grandchild shortly.